First are the homemade tombstones, enough to frighten even the bravest souls. And watch out, there’s a freakish ghoul that roams these parts wearing pajama pants and an olive green winter coat. Next is the scarecrow that wears my husband’s clothes. 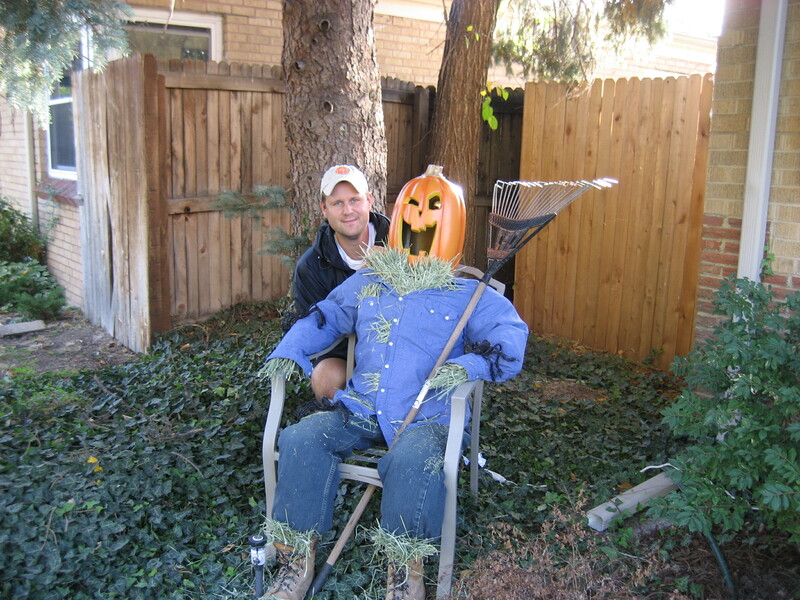 Look how lifelike he appears (no I’m talking about the guy with the pumpkin head… the one sitting in the chair). The creature was so lifelike I thought he might make good use of that rake, but alas he just sat there, watching the leaves pile up. And lastly, the Snow Witch. No, a Snow Witch is not a real thing. She was magically created from the Halloween snow that fell four years ago. What sets her apart from a snowman is the witch hat on her head and the spiders crawling across her body. If you look closely one of these spiders made a guest appearance as “spider drinking water” in Monday’s post. In my witch voice again: That’s all for this week my dearies. 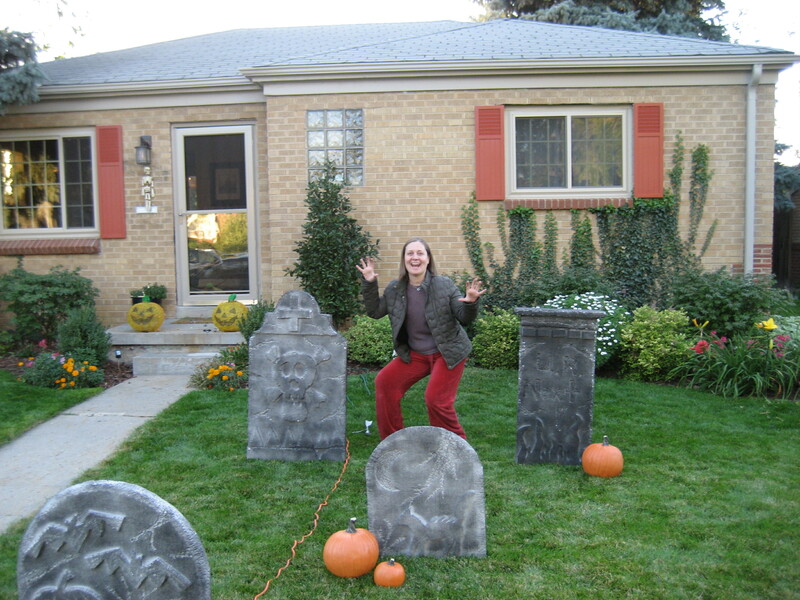 Please stop by next week for more hauntingly scary photos–if you dare! Bwahh ha ha. Hey, Spiders Get Thirsty Too! Wow, your decorations look great! If this doesn’t draw the kids to your house, nothing will. Thanks. We have more and more kids in the neighborhood, so this should be a good Halloween! Very creative post. I really enjoyed the Snow Witch. 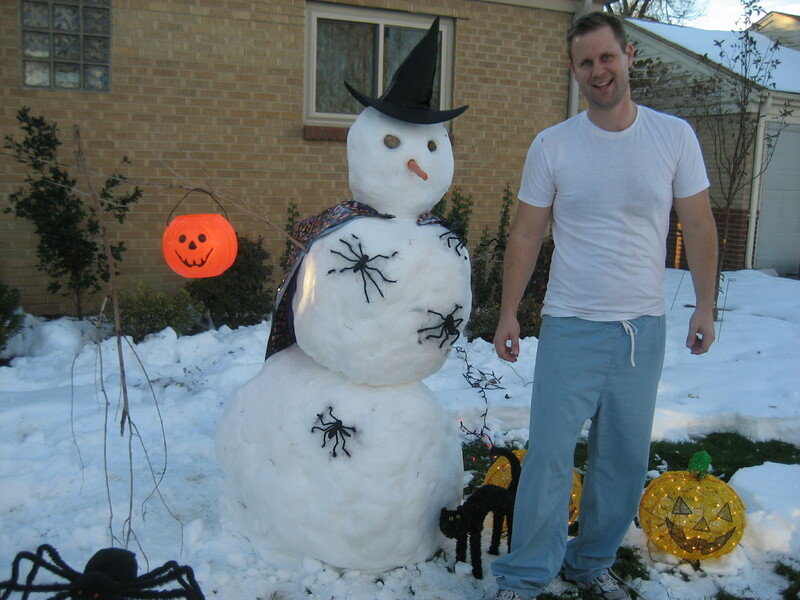 It is usually about seventy plus degrees on Halloween round here. It’s usually pretty chilly here on Halloween and it snows every few years, so all the kids have to bundle up. Seventy degrees would be great for all the costume wearers! Thanks. We made them a few years ago from a tutorial we saw in Martha Stewart and they’ve held up pretty well. OOh. I love that your spider web has a “treat” in the center. Sounds scary 🙂 Have fun decorating! I love that you get so festive about Halloween!! Do you guys have fun costumes planned for this year??? We try to really get into all of the holidays and Halloween can be so fun. We’ve bounced a couple of ideas around. We might go dark this year and do like a Night Circus thing. We better get on it though Halloween will be here in no time. Are you dressing up? What about your kiddos? A frog and a turtle–how adorable! Power rangers and super heroes not as cute, but will still be fun!